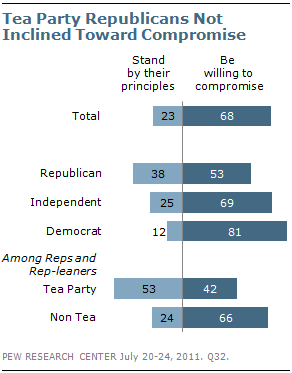 The public overwhelmingly favors a compromise in the debt ceiling standoff. And even as negotiations aimed at resolving the issue show little progress, a majority thinks that Barack Obama and congressional Republicans will reach a deal before the Aug. 2 deadline on a possible government default. The latest national survey by the Pew Research Center for the People & the Press, conducted July 20-24 among 1,501 adults, finds continued public optimism about prospects of a last-minute debt-ceiling deal. 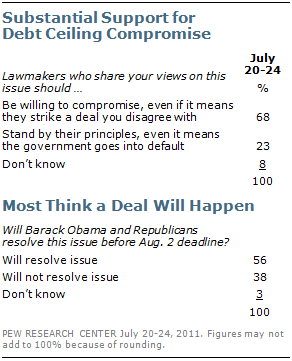 More than half (56%) say they think Obama and the Republicans will resolve the issue before Aug. 2. This is little changed from a Washington Post/ABC News survey conducted July 14-17 (54% will resolve issue). Most Americans feel a personal stake in the efforts to resolve the debt ceiling impasse. Nearly two-thirds (65%) say their own personal finances would be affected by a failure to increase the government’s ability to borrow; 32% say their finances would not be affected. More specifically, 45% are worried that a failure to meet the Aug. 2 deadline would harm their investments and retirement savings, and 46% are worried that they might lose government services and benefits that affect them personally. Barack Obama’s job approval ratings remain mixed – 44% approve of his job performance while 48% disapprove. But Obama’s ratings are far less positive than they were in May, immediately after the death of Osama bin Laden (56% approve). 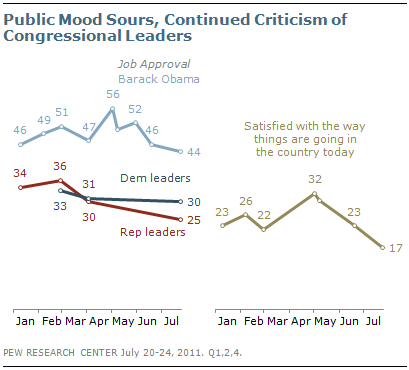 Just a quarter (25%) approve of the job that Republican leaders in Congress are doing, down 11 points since February. Ratings for Democratic congressional leaders (30% approve) are little changed from earlier this year. Republicans hold a 10-point lead over the Democrats as the party better able to reduce the federal budget deficit (43% to 33%), while running about even with Democrats on taxes, jobs and Social Security. The GOP’s advantage on the deficit is larger than it was in May (three points), but about the same as in April (12 points). However, Republicans are viewed much more negatively than the Democrats on several important traits and characteristics. 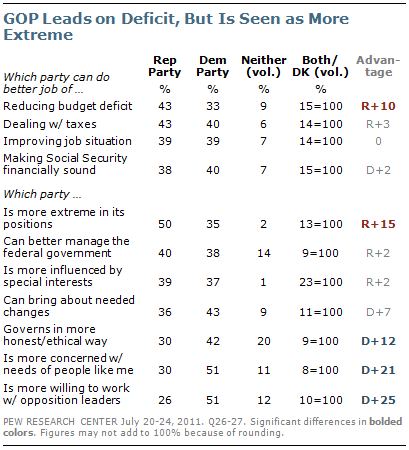 Notably, 50% view the Republican Party as “more extreme in its positions.” Far fewer (35%) say this phrase better describes the Democratic Party. Majorities of Democrats (64%) and independents (51%) view the GOP as more extreme, as do about a third of Republicans (35%). 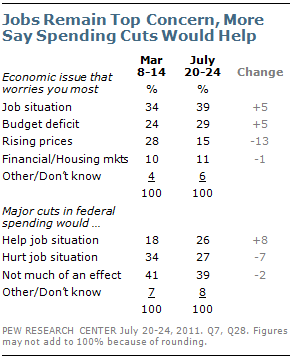 The public’s views of the impact of large cuts in federal spending on the job situation have changed in recent months. Currently, as many say such cuts would help the job situation as hurt it (26% vs. 27%). In March, more saw cuts in spending as harmful rather than helpful (34% vs. 18%); the shift since March has come across partisan lines. Yet the plurality view, held by 39%, is that cutting federal spending won’t affect the job situation one way or the other. In keeping with their desire to see compromise, there is no change in the public’s view that the best way to reduce the federal budget deficit is through a combination of both cutting major programs and increasing taxes. Six-in-ten (60%) say that both are in order; just 19% say that the focus should be mostly on cutting major programs while even fewer (8%) say the focus should be mostly on raising taxes. The proportion supporting a mixed approach of funding cuts and tax increases is about the same as it was last December (65%).